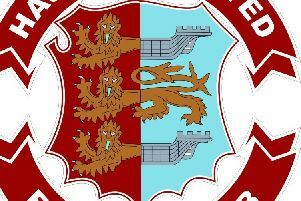 Hastings United Football Club suffered the most frustrating of defeats in a clash between two play-off hopefuls today (Saturday). Chris Agutter’s side lost 4-2 at home to Haywards Heath Town in the Bostik League South East Division, despite dominating in terms of possession and territory throughout the match. Twice Hastings equalised immediately after falling behind - Daniel Ajakaiye scoring two fine goals - but they conceded twice in the last 10 minutes to suffer only a second home league loss of the season. Hastings performed well, yet the result meant they dropped two places to fifth in the table - with Heath moving up to third - and they have now won just once in their last seven matches. Agutter made a surprise change in goal, with Charlie Horlock - an ever-present in the league so far this term - replaced by Louis Rogers. Sam Adams switched to right-back as Jack Dixon returned from suspension in midfield and Youssouf Bamba made a quicker than expected comeback from injury on the left flank. Hastings started superbly and almost scored in the opening minute. Dixon volleyed over after Lanre Azeez burst into the away box on the right. Heath barely touched the ball in the first seven or eight minutes and Bamba’s powerful angled drive following a deep cross by Azeez was well held by away goalkeeper Joshua Heyburn. Although top of the form table for the previous six games, the visitors set up cautiously, opting to let Hastings have possession across their back line and get bodies behind the ball. Bamba got to Dixon’s throughball just before Heyburn and poked it past the outcoming goalkeeper only for Heath defender Joshua Spinks to clear in the nick of time. Hastings nearly conceded in comical fashion when Sam Cruttwell’s back pass went past Rogers, but the goalkeeper scrambled back to clear off the line. Andrew Dalhouse - one-half of Heath’s big and powerful front two - headed the resulting corner over the top from close range. A decent strike by Dixon from 25 yards was pushed aside by Heyburn low to his right before Heath opened the scoring, completely against the run of play, in the 36th minute. Callum Saunders ran clear of the home defence following a ball over the top and, as the offside flag stayed down, rolled his shot past Rogers. Hastings got straight back on level terms. A good move ended with Ajakaiye latching on to Dixon’s pass and coolly slotting past Heyburn. Heath’s other bustling forward, Melford Simpson, pulled a shot well wide from the edge of the box as the first half ended level at 1-1. The visitors retook the lead in the fourth minute of the second period. Alex Laing struck a superb 30-yard free kick into the top corner of Rogers’ net for one of the best goals seen at The Pilot Field this season. Again Hastings replied instantly. Ajakaiye scored his second with a great strike high into the far corner of the net from the left-hand side of the box. Heath enjoyed a good five-minute spell just before the hour, during which Karl Akehurst had the ball in the Hastings net only for the referee to blow for a foul on Rogers and Trevor McCreadie then poked the ball past Rogers but Tom Climpson cleared from near the goal-line. Normal service duly resumed, with the vast majority of the play taking place in Heath territory. Hastings kept probing and you felt a goal would surely come, but they couldn’t quite come up with the bit of magic they needed in and around the visitors’ penalty area. A snap-shot by Bamba from the edge of the box was well parried by Heyburn low to his left and the goalkeeper also did well to hold an angled drive by Hastings substitute Jordy Mongoy, who had skipped past Spinks. Heath hit the front for the third time in the 86th minute. The man mountain Simpson shrugged off Climpson and drove past Rogers, although Hastings really should have been awarded a free kick for a high foot in the build-up to the goal. Hastings’ misery was made complete by a fourth Heath goal in the second minute of added time. The home side lost possession in the middle of the pitch and McCreadie - a one-time Hastings player - made his way through before rounding Rogers and slotting home. Hastings: Rogers; Adams, Climpson, Cruttwell, Fielding; Lovatt, Pool, Dixon; Azeez (Mongoy 75), Ajakaiye, Bamba. Subs not used: Janneh, Eweka, Walker, Horlock. Attendance: 376. Bostik League South East Division top half (played-points): 1 Cray Wanderers 27-68 (+39 goal difference), 2 Horsham 28-55 (+22), 3 Haywards Heath Town 28-52 (+17), 4 Ashford United 27-51 (+28), 5 HASTINGS UNITED 28-50 (+20), 6 Whyteleafe 27-41 (+11), 7 VCD Athletic 26-41 (+3), 8 Hythe Town 28-40 (+6), 9 Ramsgate 28-36 (+5), 10 Phoenix Sports 27-35 (-4).